The expectations for most 19-year-olds aren’t exactly overwhelming: Start learning a trade and try not to screw up too badly. 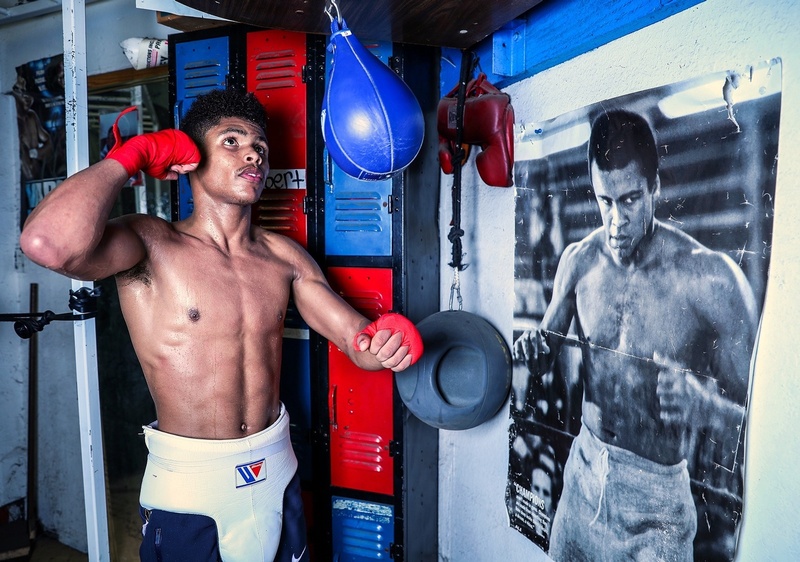 Newark’s Shakur Stevenson already has a vocation, having won a silver medal as a bantamweight boxer at the 2016 Summer Olympics in Brazil. But unlike every other 19-year-old, who gets to fail anonymously, Stevenson has no such luxury. And he didn’t say this flippantly. Many reporters who were within earshot of Mayweather in Rio de Janeiro last summer came away with a similar quote. And even though the undefeated boxing legend-turned promoter failed to sign Stevenson (that honor went to Bob Arum’s Top Rank), the compliment was never rescinded. And as was the case when decorated Irish amateur Michael Conlan turned pro with a technical knockout win over Tim Ibarra in New York last month, Stevenson arrives with tremendous support and expectations. Whereas the 25-year-old Conlan had MMA star Conor McGregor in his entourage, Stevenson is being managed, in part, by his own idol: unified light heavyweight champion and former Olympic gold medalist Andre Ward. 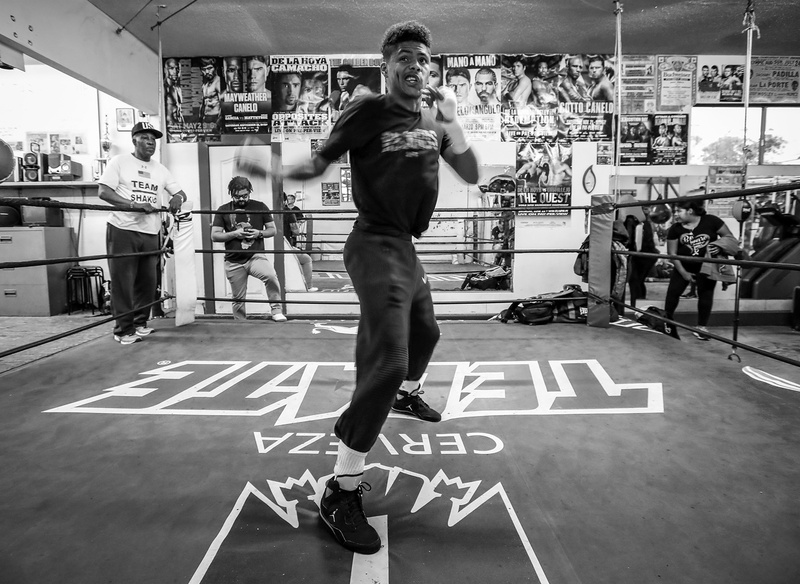 The mere fact that Stevenson is debuting on pay-per-view while taking in a $20,000 purse, according to the California State Athletic Commission, is another strong indicator of his perceived potential. Young fighters do not pull down six figures in their first bout, nor do they do so under the guidance of esteemed veterans, such as Ward. Fightland: What changes for you as a pro? How is this different from being an amateur? 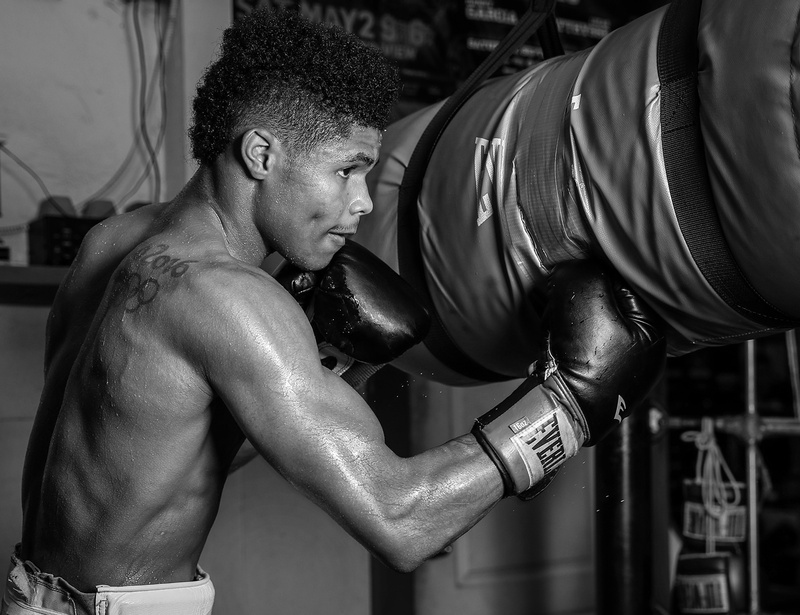 Shakur Stevenson: It’s a lot different, being that we get to weigh in the day before. With the amateurs we had to weigh in every single day. And it’s a lot more rounds now, so I could be a little bit more patient. It’s a lot different and I’m excited about that difference. It was hard for me to make 123. So I’m glad I don’t got to go through that no more. As a professional, is it easier to scout opponents? You have Edgar Brito on Saturday. You definitely get to look at your opponent on YouTube or wherever. You can see some of their fights. I saw one of [Brito’s] fights. Many boxers are critical of amateur judges. Is it nice to put them behind you? I feel like the amateur judging is kind of messed up, so I am relieved I don't got to deal with that. But I feel like there’s some messed up judging in the pros. Because I’ve see a lot of bad judging there too. How would you like to pace your career? How many times a year do you want to fight? I’m not going to choose. I’m gonna let Top Rank and my managers handle that part. I’m not gonna choose when I fight. But me, personally, I’d like to fight as much as possible. That’s a lot, but I wouldn’t mind doing that either. 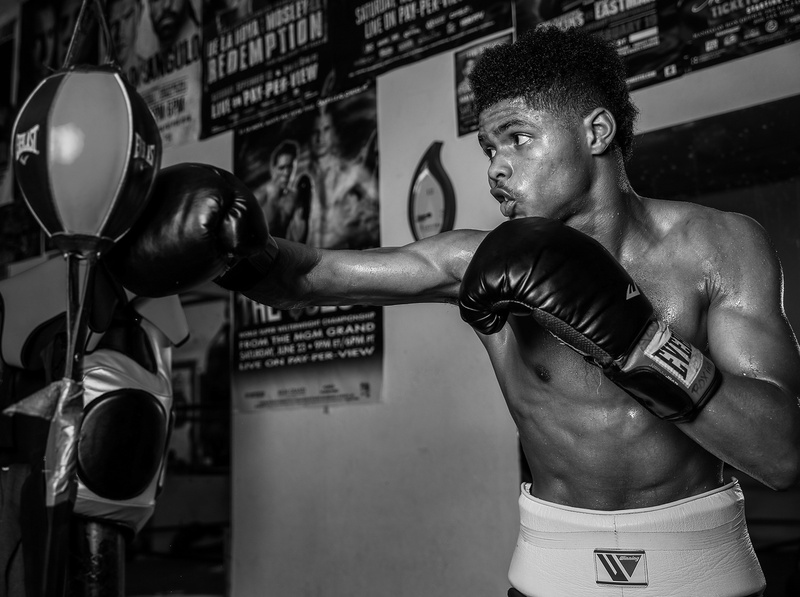 Floyd Mayweather called you “The Next Floyd Mayweather.” Is that a blessing or a curse? 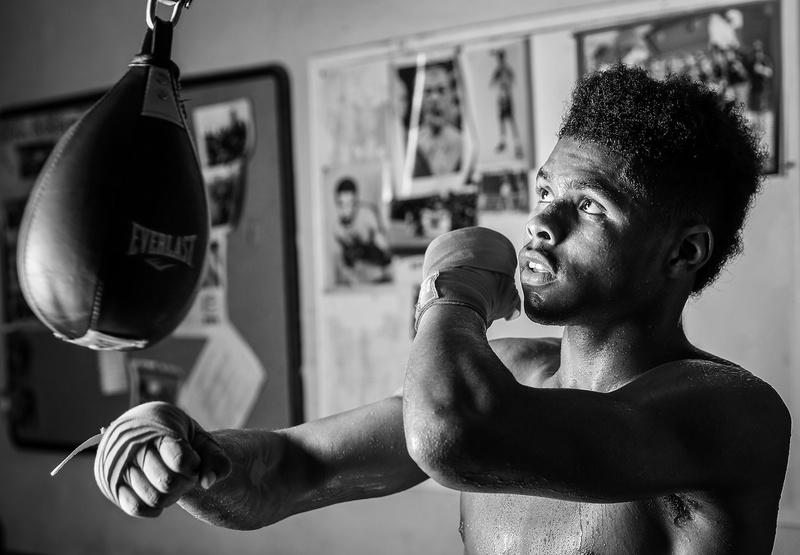 I wouldn't say it’s a curse, but I wouldn’t call myself ‘The Next Floyd Mayweather.’ I’d call myself ‘The First Shakur Stevenson,’ but it’s a good title to have. Unified light heavyweight champion and former Olympic gold medalist Andre Ward is one of your managers. What’s the best piece of advice or the best lesson he’s given you? I would say mainly: Stay focused. I go to training camp and watch Andre train and I love watching him train. His focus is amazing. He’ll be so locked in, sometimes he’ll come into the gym and he won’t even speak to me. Then after he finishes training, everything will just be normal. 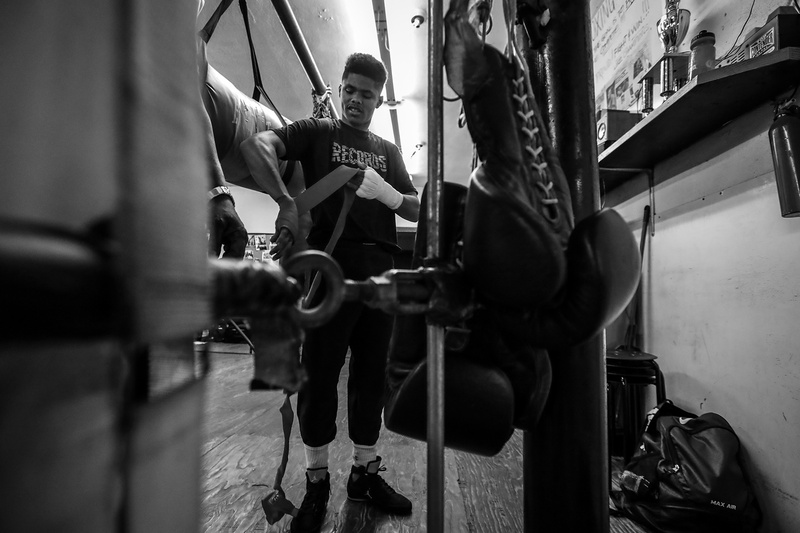 Does that experience make boxing seem more like a job than a hobby or pastime? I love boxing, so I wouldn’t say it’s just a job. It is a job, and I’d say it's a hobby for me too. I’m glad this is my career. Has Ward spoken to you about promotion and the business side of the sport? This isn’t something you have to think about as an amateur. He talked to me about the business side all the time. He helps me out a lot. What do you think about self promotion? When you become a pro, you’ve got to be your own PR person. Some guys try and create news to promote a fight. I feel like I don’t got to do nothing out of my character just to get some type of fame or promote a fight. I feel like me being myself is going to promote the fight—get me a lot of money and get me a lot of fame in the business. So nothing like what’s going on between Sergey Kovalev and Ward? Kovalev has said a lot of nasty things about Ward. As you turned pro, were there a lot people giving you advice? Boxers and such? Most definitely. As soon as I turned pro, a lot of good fighters hit me up, like Terence Crawford and Andre Ward. Well, Andre Ward was playing a part anyway. Are you ever skeptical of the advice you’re getting? You got to realize who you’re getting advice from. If it’s somebody that don't have the knowledge to say what they got to say, then it probably ain’t the best advice. But if it’s somebody that’s been there before, and got the knowledge and knows what they’re doing, then most likely I’m going to take their advice. Your name and Michael Conlan’s name are often mentioned together. You’re both young, both signed to Top Rank, and you both competed as bantamweights at the 2016 Summer Olympics. Can you start thinking about a fight against Conlan (1-0, 1 knockout) or do you need to establish yourselves first? We both got to establish ourselves. We can’t let nobody beat us. We got to prove ourselves and get to that point. I see that everybody is making it a big fight already, so that's cool. I did training camp with him like two weeks before the Rio Olympic Games, so we was in training camp together. It was cool. Anytime I went to go spar, he’d come over and watch me spar. And every time that he sparred, I’d go over and watch him spar. So we was well aware of each other. Fighters like Ireland’s Conlan typically have entire countries in their corner. But these days, the same can’t be said for most Americans. We have a lot more competing sports in this country. Do you feel like Americans get overlooked? I do feel like some American boxers don’t have the support. But I feel like that I got great support. I feel like the city of Newark is behind me. And I feel like that’s all I need. They put Michael Conlan in New York, and if they put me in New York, I feel like Newark is about 25 minutes away from New York. I could definitely draw a lot of fans there, so it would be a big fight. What about fighting in Newark? Most definitely—I want to fight at Prudential Center. That's my home. I’d love to come back home and put on a show. Which fighters did you watch growing up? The main three guys I watched growing up were Andre Ward, Floyd Mayweather, and Pernell Whitaker. Lately I’ve been watching a lot of [Vasyl] Lomachenko and Terence Crawford. What stands out about Lomachenko? Lomachenko, he just dominates every fight he’s in. Every fight he’s in, he dominates. He doesn’t lose rounds. I want to be something like that. I imagine you watched old Pernell Whitaker clips on YouTube? 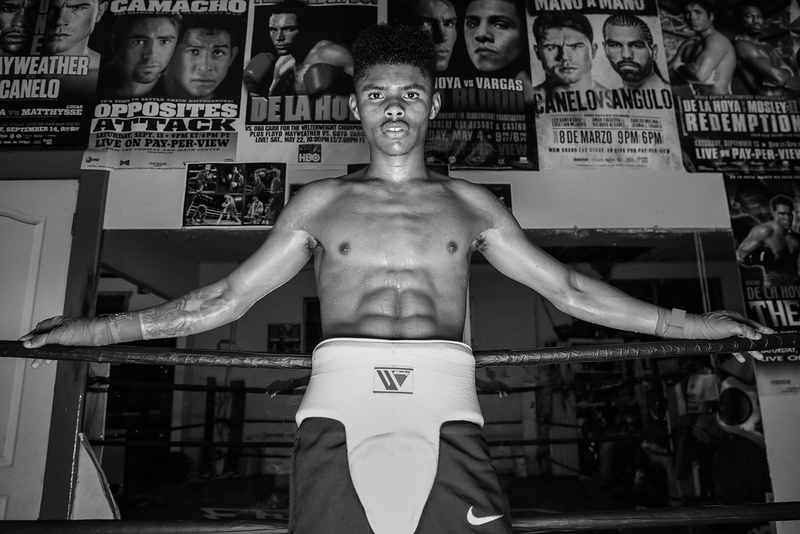 Some have made a comparison between him and Lomachenko, citing their technique and style. Do you see any similarities? I don’t really see the comparison. They got some of the same style—hit and not be hit—but I feel like there’s a big difference. I feel like Lomachenko has his own style. I’ve never really seen a style like that in American boxing. So are you envisioning a fight between you and Lomachenko at some point? Most definitely. I want to get in the ring with him later on down the line because we’re close in weight. That would be my dream fight. I got to prove myself first. You have a lot of options around featherweight: Leo Santa Cruz (33-1-1), Carl Frampton (23-1), Gary Russell Jr. (27-1). At 130 pounds you have Lomachenko and Mikey Garcia (36-0) is at 135. Is the plan to stay at featherweight? I feel like I’m just gonna let my body grow the way it grows. If I get older and I grow a lot, then I just grow. Until then, my eyes are on taking over the 126 division. What’s it like to be paid now? I’ve spoken to young pro athletes who’ve admitted that the business of sports intimidates them. It don’t intimidate me. I’m glad they’re being professional and actually giving money after I fight. So it’s a blessing. Where are you living and training? I live in Virginia and I train in Virginia. I train at Alexandria, VA.
Would you ever consider getting a college degree in your spare time? Any subject? Most definitely, I plan on going back to school. But if I do go back to school, I’d rather do it online. I don’t have nothing in mind. Probably the business part though. Welterweight Chris Algieri went to college (Hofstra) and became a nutritionist. He worked with Danny Jacobs and was actually in his corner for the Golovkin fight. I didn’t know that. That’s cool. What’s your first professional training camp like? You got to start running a lot more miles and start sparring more rounds, because you’re gonna be in there a lot longer now. That was my main focus. You’re sparring with bigger fighters? I got Keyshawn Davis from Norfolk, VA and there's a kid who’s like 165 from my gym. They’re like my brothers. I’ve been sparring with them for this camp. Any family at your first fight? Some of my family is coming out. I don’t think my mom is coming. The [price] went up a lot after she waited [to buy tickets]. What about inserting your own style into your fights? Now you choose your trunks, pick out your music, etc. I love the fact that you can get your own uniforms and come out with your own music. I feel like it’s a different environment in the pros. I’m gonna like it.